LG’s mammoth product display is always a highlight of the Consumer Electronics Show, and this year all eyes were on LG ULTRA HD 4K TV. With a resolution that’s four times greater than full HD 1080p, our ULTRA HD TV represents a new standard in home entertainment. *4K/UHD delivery standards are still being developed. Until now, viewers have found it difficult to tap the numerous offerings of Smart TVs. However, with the arrival of LG webOS™, ULTRA HD TV users can now enjoy a completely redesigned home screen that makes it easy to navigate an almost-endless world of entertainment options. ** With webOS™ interface, LG delivers Smart TV the way it was always meant to be: simple, seamless, intuitive, fast and powerful. *webOS™ not available on all Smart TVs. webOS™ model shown. **Internet connection and certain subscriptions required and sold separately. Content and service vary by product and are subject to change without notice. Regardless of how advanced a television may be, it’s a brilliant picture that makes a TV rise above the crowd. With 8.3 million pixels – four times that of Full HD 1080p – the LG ULTRA HD 4K TV offers eye-opening image quality with incredibly vivid details. Plus, with the latest IPS technology, you can enjoy sharp, lifelike images and rich colors from virtually any distance or viewing angle. Every day sees more and more content providers offering 4K resolution streaming. Netflix is committed to the future of 4K, and broadcasters are adopting 4K resolution for sports programming, with an expanding range of 4K entertainment waiting in the wings. But why wait? LG’s Tru-4K Engine Pro resolution enhancer upscales HD and even SD content to a quality that’s as close as you can get to native 4K content. It’s nearly impossible to tell the difference. Now, all of your Blu-rays, DVDs and video games can look amazing on an LG Tru 4K TV. Get ready to be blown away with images that are sharper and brighter than any 3D you’ve ever watched at home. In addition to enjoying your favorite 2D content, LG ULTRA HD TVs also give you the ability to watch the latest 3D entertainment – or convert 2D content into a stunning 3D experience. Plus, because our 4K 3D TV comes with glasses that are lightweight and battery free, you can watch your favorite content more comfortably. Just be sure to keep a few extra pairs of LG 3D glasses on hand. Something tells us you’ll have plenty of guests! *Disclaimer: Viewing 3D video content may cause discomfort. 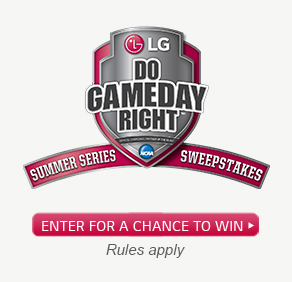 Visit LG.com for details.